Subject to availability, you may make changes to a Group Booking up to 4 weeks prior your arrival date without charge. 1. A charge equal to 10% of the total booking value will be charged for any amendments made with less the 4 weeks prior to arrival. 2. Changes to a confirmed reservation, (e.g. changes to dates or number of guests), are subject to the availability of a suitable alternative and may be subject to change fees, if applicable. 3. We will inform you of any additional cost in writing prior to the change. No change will be made without agreement. 4. Cancellations of a confirmed booking will be subjected to a 10% administration charge, which will be deducted from the amount paid. 5. Cancellations where less than 4 weeks notice is given, the total booking amount will be chargeable. By giving us your credit card details you are authorising us to use this as security for your reservation and your accommodation. Any unpaid cancellation charges will be charged to your debit/credit card. 6. Cancellations are required to be in writing, either in the form of a letter, fax or email. No cancellation can be made by telephone. 7. Early departures are not eligible for refund under any circumstances. 1. A group is any party consisting of 10 people or more. 2. Rooms are available at 2pm on the day of arrival; however you are welcome to drop off any luggage in the morning. 3. You do not have to be a member of any organisation to stay at Safestay however we do require that some form of valid photo identification upon check in, preferably a valid passport, I.D. card or driving license. 4. Departing groups must remove all their belongings from their room, and check out, before 10am. After this time groups may make use of the luggage storage facilities but all possessions must be removed from the room and the room key card handed back to reception. 5. All Groups must have minimum one Group Leader who is responsible for the entire group. Leaders will be the contact person for our staff, and will be expected to act on all complaints. 6. A 250.00 security deposit is required at check-in for any damages/vandalism caused to the hostel. This deposit will be returned on the day of your departure if no damage is detected. You can leave the deposit by cash or debit/credit card. Cards will be pre-authorised on check in for the full amount. If your deposit is being secured for with a third party credit card we will require written authorisation to be provided by the card-holder. 7. Upon check-in each guests will receive a room key card for access to their room. These key cards are activated for the period of stay only and must be handed back to reception on check out. Failure to return the key card will result in a charge of 5.00 GBP per card being deducted from your security deposit. Payment for Group Bookings is pre-paid. All payment must be sorted prior to arrival or you may be hindered from checking-in to the property. 1. 10% of the total booking value will be required as a deposit to confirm your booking. Bookings will not be confirmed unless the 10% deposit is received at the time of making the booking. Payments can be made either by Visa, MasterCard, Switch, and Debit Card or in some cases cheque, Bank Transfer or cash. If your booking is being paid for with a third party credit card we will require written authorisation to be provided by the card-holder. 2. Bank transfers must be accompanied by the banks proof of payment. 3. We do not accept Laser Cards or American Express. 4. The remaining balance must be paid at least 4 weeks before your arrival date. This is to include all extras and fees. 5. All payments must be made in Pound Sterling. 6. Payments shall be made in such format as agreed with you when we confirm the booking. 7. All fees incurred by the payee due to the method of payment, (i.e. bank transfer fees issued by the sending or receiving bank), are to be paid by the group. Safestay Ltd is not responsible for these fees. 8. If any payment under these terms and conditions is overdue, then without prejudice to our other rights and remedies we may cancel your booking; and/or we may suspend the supply and/or deliveries of any other services provided to you by us. We will however inform you in writing prior to any such action. Group Leaders are responsible for the behaviour of all members of the group at all times. 1. At least one leader will be required to sign a statement of intention to uphold the rules set in place for groups upon arrival. The group leaders must ensure that all members of their group behave in an acceptable manor. 2. Group leaders are responsible for all damage caused by their actions, or the actions of those in their group, including accidental or incidental damages. Damages will be deducted from the security deposit paid, and remaining costs will be required to be paid, or a payment agreement reached prior to departure. 3. If your groups behavior is deemed to be unacceptable, in violation of the laws of the land or causes damage to our property, your booking may be terminated without notice and you may be asked to leave our hostel premises. No whole or part refunds are given and your security deposit will be forfeit in these circumstances. 4. Smoking is not permitted anywhere within the Safestay premises. Any group member found smoking within the building will be charged a fee of 250.00 in order to cover the extensive cost of restoring the room to a smoke-free condition. Further failure to comply will result in the group being asked to leave the premises immediately and will not be offered a refund. A smoking area and ashtrays are provided in our garden and outside the building. 1. Guests are asked to use the secure lockers provided in each room, the safety deposit boxes at reception or the luggage store. 2. It is the guest&#39;s responsibility to ensure that their personal belongings are secure at all times. 3. Safestay accepts no liability for the loss, theft or damage to property however sustained or caused. 4. Guests will be expected to reimburse Safestay for any damages caused by inappropriate behaviour during their stay at any of the Safestay&#39;s.
Safestay shall only store and use information you supply to us or which is supplied to us for the purposes of carrying out our contract with you and to inform you of other services and offers which we make available from time to time. If you do not wish to receive such information please let us know by emailing us at: reception@safestay.co.uk or by writing to us at Safestay, John Smith House, London, SE17 1JL. Any oversights or errors in sales literature, web pages or site, order form, quotation, price list, order acknowledgement, despatch note, invoice or other document issued by us may be corrected by us without liability. We will advise you of any changes at the time of booking or as soon as is reasonably possible thereafter. Before confirming your booking you should read through the group FAQ’s and understand the terms and conditions. Your contract is with Safestay and not the OTA (Online Travel Agent) if you choose to use their services. Safestay Holland Park is ideally located in the heart of London, nestled within one of the capital's most prestigious parks. 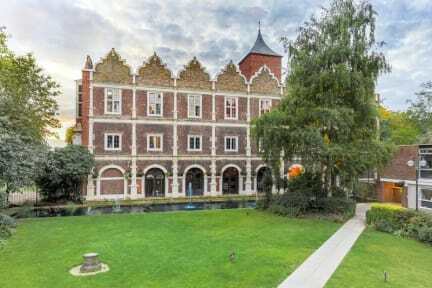 This stunning hostel consists of 3 buildings, including the East Wing of the park's original Jacobean building and surrounds our private courtyard garden. The property has been fully refurbished to the high standards for which Safestay is renowned. The Grade 1 listed building is located on the edge of London's famous Holland Park(search for Holland walk and duchess of Bedford Walk on your maps) and will provide Safestay guests with the opportunity to stay in the heart of one of the capital's desirable neighbourhoods. The property dates back to 1605 along with a 1950's extension and is situated in a huge garden within the middle of one of London's most beautiful parks. Historic, Jacobean splendor, in a great city location. Who says you can’t have it all? This mansion in the middle of Holland Park was visited by Sir Walter Scott, Lord Byron and Dickens. Today it offers large, comfortable rooms to you. Three different houses with a range of standard & ensuite rooms as well as family rooms & private rooms for everyone! Pool room, breakfast room & bar as well as garden, roof terrace & the whole Park itself with its famous beautiful woodland trails, manicured lawns, the Kyoto Japanese Garden with its resident Coi, and a fantastic ice cream stand in the middle. Opened in 1952, Holland Park used to be a private estate belonging to the Earl of Holland. During the 19th century the Holland House attracted high profile visitors from various walks of life, from the politician, Lord Palmerston, to the poet, Lord Byron. Safestay Holland Park has excellent transport links and is within easy reach of The Natural History Museum, Holland Park Avenue, Notting Hill Gate, Portobello Market, Harrods, The Science Museum, Hyde Park, Westfield Shopping Centre and Kensington Palace Gardens. Dormitory style and range in size from 2 beds upwards. They offer mixed accommodation. Clean fresh sheets included in the price. Lockers available in rooms. Towel hire available at £2 per towel with an additional £5 refundable deposit. Breakfast not included - 5.00 GBP per person per day. Bookings cannot be accepted from any person age 16 years or under, unless they are accompanied by an adult (over 18) who is staying in the same dorm/room. Families with children aged 16 years and under are welcome, however they must book and pay for all beds in order to make the room private (i.e. in the case of 4 bedded dorms or larger). Alternatively we have 2 Bedded and 3 Bedded Private rooms available, subject to availability. Look out for the Peacocks!